Home / Encaustic Product Reviews / Why use encaustic gesso to prepare a substrate? Posted on March 18, 2011 Author Victoria	35 Comments on Why use encaustic gesso to prepare a substrate? start with an excellent surface for adding a huge variety of media to our Encaustic works of art before laying on the wax, such as soft pastel, charcoal, watercolours, gouache, marker, graphite, etc. Why can’t I use acrylic gesso with encaustic? Manufacturers of encaustic paints specifically advise artists not to use acrylic gesso. Acrylic gessos aren’t archivally sound. Acrylic is not absorbent enough to accept the wax. Your painting will eventually lift off of the acrylic surface, and the acrylic will also begin flaking off of the wax surface. In Joanne Mattera’s The Art of Encaustic Painting, one artist claims to have seen the wax of a completed encaustic painting slide right off of the acrylic gesso! If you want to sell your encaustic artwork, keep your clients, art buyers and the galleries representing you happy by making encaustic art that could potentially last as long as the centuries-old Fayum Portraits, then only prepare your substrates using gesso that is made for encaustic. I’m an artist who has just started using encaustic in my art work. Having my paintings last and be archival is of high concern for me. I’ve heard that it is okay to prime with acrylic and then coat the acrylic with oil to create an absorbent ground, is this true and will it last? Also what is your take on using fast drying oil mediums(particullarly W&N Liquin) with wax? Regarding the use of an oil-based gesso on top of an acrylic gesso as a base for encaustic artwork, this could be a costly and time consuming endeavour to pursue with uncertain results. There are many tried and true alternatives I suggest you try instead. Although it is true that you can paint oils on top of acrylics, even oil-based paints on an acrylic gesso, over time, will still be oil based paints. What I mean by that is that oils take months, even years to completely dry and when they completely dry, they become somewhat brittle. This is contrary to acrylics, which will possess tremendous flexibility for centuries. Therefore, if the oil paint on the surface of the flexible acrylic ground becomes brittle, it stands to reason that it would eventually flake off of the acrylic ground. If you are concerned about producing works of encaustic art that will stand the test of time, I would suggest you avoid the process. With encaustic on acrylic, the acrylic simply does not accept the wax. – (commercially available) R&F encaustic gesso – excellent tooth, whiteness/brilliance (for reflection through your transparent encaustic glazes), matte finish. Fredrix Gesso Dry Ground Mix and Evan’s Encaustics Holy Grail ground, also commercially available, are fine as encaustic gessos. – although I’ve read some encaustic artists complain of chipping on the surface, many encaustic artists now use Clayboard, which is essentially white clay on hardboard. There are many more possibilities you could try experimenting with, including drywall compound, chalking, marble dust and more. Regarding your question about using Liquin with encaustic, I’d say go ahead as long as you use no more than 30% oil based product/paints with 70% beeswax/encaustic, otherwise you risk compromising the ability of the wax and or oils to dry. Why does R&F Encaustic Gesso have the statement “A High Solid Absorbent Acrylic Gesso Specially Formulated for use with Encaustic Paint”? 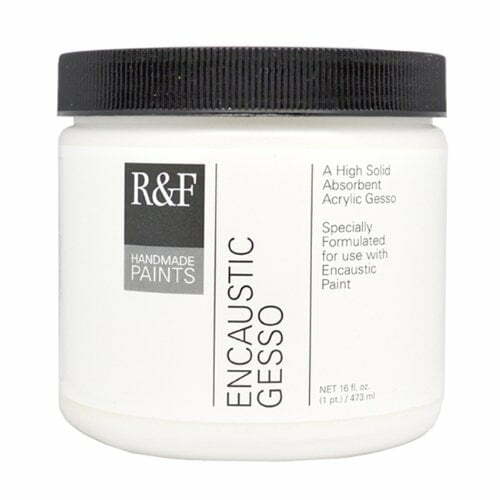 If Acrylic is incompatible with Encaustic, why are R&F using Acrylic in their Gesso? Perhaps to justify the hgh cost of their Gesso? I have used Acrylic for many years; and the R&F product appears to be the same! Here’s the thing… I have an expensive tub of R&F gesso and now that I read the label I can see that it is acrylic. I was told acrylic gesso would not work because the wax would not adhere to it and yet R&F is selling acrylic gesso for use with encaustics at a huge price! It says right there on the label that it is a highly absorbent acrylic gesso. It does not need to be refrigerated so it obviously is not made of rabbit skin glue. I have recently learned that all those expensive gel mediums and clear gessos used to thin acrylic paint and make glazes for use in mixed media pieces are actually PVA glue and marble paste or even things like talc, plaster of paris, joint compound etc. No longer will I spend tons of money on these things. I make my own gel mediums and gessos now. I am trying now to find out what the heck R&F does to the clear gesso other than adding pigment to it to make it work with wax medium. 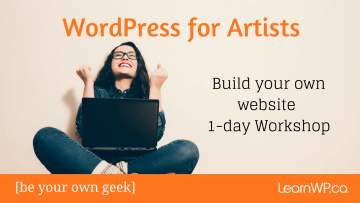 I would be interested to know which works the best for you since you have been making your own already. Any advice? TY! I have finished probably 25 encaustic pieces with “acrylic” gesso from RF. I didn’t realize I wasn’t supposed to use it. I only used a thin layer on my birch plywood. Nothing bad has happened so far, but does anyone have a piece that is years old to give an opinion on the future of my mistake? I do not use encaustic gesso and I have made hundreds of encaustic paintings. I have had no chipping and nothing has fallen off… That being said I never embed objects. The most important thing is fusing it well. And the first fuse is the most important. If you can pull it off at the edges after you have fused it, then it is not ready. As far as making paintings that last as long as the Egyptians, you have to ask yourself “did they use encaustic gesso?” I do buy some products meant for this medium, but many things are overpriced but you can find in hardware stores or make yourself. The medium itself is a great example. Melting wax and resin together just is not that difficult and yet it will save you a bundle. Adding pigment to it doesn’t take much more time. I am just beginning to use encaustic and I have some boards that I have been working on. They have layers of a lot of collage and acrylic paint. Is there any product that I can use to isolate this and then do encaustic on top so the underwork still shows through. I gather if I use encaustic gesso it might cover up the work underneath. Any suggestions. Norma- regarding isolating your collage: believe it or not Modge Podge- use the product by name- I would not substitute matte medium or the like. This is a big violation of the “no acrylic” rule, but I saw it done at the annual Encaustic Conference several years ago by a respected artist and it works fine. I have used it too, but mostly I do not need to use it. Don’t ask me why it works- this might be the one and only acrylic compound product that has enough porosity for encaustic to work with. I have not tried sealing an entire painting surface with it, just select smallish areas. I am interested in making my own hardboard grounds for encaustic but still trying to keep my costs down…. do you have any information on using powdered R & F encaustic gesso compound…… like how its mixed and if its more cost effective than the premixed encaustic gesso???? I think the least costly alternative to encaustic gesso would be the Behr paint primer product designed for use beneath their faux Venetian plaster product line. I say this because they incorporate an application of wax onto the product, thus (hopefully) representing wax absorption onto the product’s surface. I have never actually used the Behr product, but I have heard positive reviews from encaustic artists looking to maintain an archival quality to their art works. I decided to try the Behr product and was surprised how thick it was. It think it will be hard to get a smooth ground surface with this product unless it is thinned out or sanded between coats. Anyone have expereince using the Behr Venetian Plaster base coat 770? BAD bad idea to use commercial paints/primers under artist materials. Commercial products are not of the same quality- given around 10 years or less you will likely see a fine network of cracks developing under your oil painting and flaking off of paint; I would expect serious adhesion failure under encaustic (in far less time). These primers are still acrylic (plastic) based. I have been painting a long time and have seen commercial paint/primer fail under my early oil on canvas paintings from school. I know better than to use it under encaustic- there are other solutions to prepared surfaces! I have not mixed up their product from dry powder but just go to their website or call them- they are very helpful and want people to use their products properly. Intuitively I would say to mix it the same way you would plaster of paris, mixing the powder to cold water. I have a much cheaper solution- just use “Old Fashioned Milk Paint” a good quality commercial milk paint. It is pretty much the same thing as the encaustic gesso. I add their “extra bond” to coat hardboard; this is not necessary if priming raw wood. The “extra bond” is actually an acrylic, but you are not using that much. (R&F has a little something extra like that too I am sure) The surface is dry and chalky- nice and porous. Costs quite a bit less than the encaustic gesso too. Comes in a variety of colors too. I stick with white or a warm off white myself. Helpful hint- use a wire kitchen wisk when mixing these dry powders to water. So now you say that their Gesso is milk paint. very interesting I must say. lol… But R&F encaustic gesso says it is acrylic and milk paint is made with milk and lemon juice or something – right? BTW, I have recently learned that all those expensive gel mediums and clear gessos used to thin acrylic paint and make glazes for use in mixed media pieces are actually PVA glue and marble paste or even things like talc, plaster of paris, joint compound etc. No longer will I spend tons of money on these things. I make my own gel mediums and gessos when I’m working with acrylics instead of encaustics. Still waiting for your comments. Hi Norma…sorry to not have replied earlier – I had tons of art classes and workshops I was giving/exhibitions happening between cities over the last couple of months and then my sweet and cool (artist) Mom got sick…she is a bit better so I can breathe again! To the best of my knowledge, I’d have to say your best option might be to do as I would – that is, create an appropriate product yourself. I say this because acrylic is resistant to encaustic – they simply react very differently to the environment and, thus, to each other. I mean to say, acrylic will resist wax eventually..it is simply a matter of time and when that happens, the wax can fall right off of the acrylic surface! The first thought that comes to mind would be to investigate the oil-to-latex primers. I realize these are white, but research the contents of the product because if you can discover the binder and matting agent you can forgo the use of the calcium carbonate/whiting/chalk which is the substance used to whiten the primer, thus giving it the opaque and non-translucent surface you are trying to avoid. Another somewhat radical, yet interesting/unique option would be to adhere a transparent, encaustic-receptive substrate to the acrylic work you’ve done. That is, specifically, Plexiglas. Plexiglas has been used by various encaustic artists as a substrate – most ‘famously’ Joanne Mattera – without any adverse reactions, thus far. You can buy Plexiglas at home improvement stores in varying thicknesses – stick with the thinnest to best reveal your artwork through the surface, and then use encaustic on it’s surface. 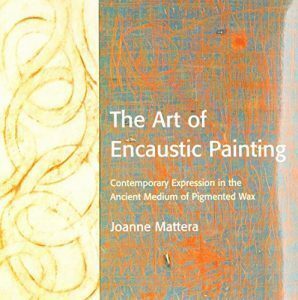 Check Joanne Mattera’s book out for specifics: The Art of Encaustic Painting. Let me know what you decide to use as a resolution, Norma – this is the best way new artistic roads are paved! *I should add that you may adhere the Plexiglas to the painting you have already created with an acrylic medium- but don’t cheap out! Something thick, like TriArt’s Clear Modelling Paste. I am a devoted pastelist and am searching for a way to top off my paintings with clear encaustic wax. I began my experiment with encausticbord (ampersand product) and was immediately confronted with the lack of a sanded surface to grab the soft pastel. Decided to use a little Golden acrylic ground for pastels but am concerned it will influence the durability of the painting. What would you suggest using (hopefully free of animal products.) Can I throw some pumice in the encaustic gesso? I am also looking for a product to seal the pastel before applying wax. Do you have any suggestions there? Thank you for your help! If you don’t care about your artwork lasting for any significant length of time, acrylic grounds under encaustic are fine. But, as I mentioned in my article, above, acrylic and encaustic repel each other, so using acrylic under encaustic won’t stand up to seasonal/climate changes, since there will be no adhesion between the two media. It’s as simple as that! However, you can use R & F’s encaustic gesso as a base for the pastels – *I’m assuming you are talking about soft pastels. The gesso has a matte, extremely fine tooth to the surface which I have found to be excellent for pastels – check out my website for examples http://www.victoria-wallace.com/ the first three images in the encaustic section were painted with pastels and other dry media before using the encaustic medium/pigments on top. Alternatively, you can add pumice to the gesso, itself, and then paint it on your substrate, providing a nice even coarse surface perfect for your pastels. When you are ready to apply the encaustic medium, just blow off the excess pastel dust before doing so. Apply the medium gently with a brush to your pastels. You will find there is little to no bleed of the pastels into the encaustic, however the pastels will darken in the same manner they would as if sprayed with a fixative. Lastly, the pastels*. You can use oil pastels, but don’t use more than 30% oil based pastels (or any oil based products, including oil paints) under the encaustics, since too heavy of an application of oil based products will result in a diminished encaustic adhesion and, thus questionable archival quality. Best to use them after/on top of the encaustics. However, as I said, the soft pastels are great under the encaustics. Use to your heart’s content! I have never worked with encaustics, mainly because of the expense. However, I have some old acrylic paintings that I love the texture. Can I apply encaustic gesso over these textured pieces and then paint them with watercolors or pastels, then use wax medium as the final coat? Hi Eva – Sorry for the late reply and thank you for your inquiry! You can certainly use the encaustic gesso over the acrylic. There should be no problem with the combination of watercolors and pastels with the encaustics either. You can then use the wax medium as a final coat. I’d say never combine acrylic with anything oil based…don’t even use acrylic gesso w/oil paints..or paint oil over acrylic. My question is straight oil paint over encaustic?? I’ve created some pieces this way and am happy with the outcome except the painted oil areas have a flat finish as compaired to the encaustic finish which can be buffed to shine. Should I “oil out” the flat oil painted surfaces to get some consistancy in shine? Hi Victoria: great information! Is it necessary to seal hardboard, ex: GAC 100, before applying encaustic gesso? Give the board a light sand to give it an absorbent tooth before applying your beeswax, encaustic medium, etc. If you don’t, the smooth surface of the board may not have the adhesion you’d like for a long lasting piece of encaustic art work. Use 180, 220, or 320 grit sandpaper – as I’m sure you know, the lower the number, the coarser the paper, thus the higher likelihood of leaving visible scratches in the surface. I use any of the above because I know I will apply enough encaustic waxes to conceal any scratching that might have occurred. Wipe the dust off with a soft cloth before coating with wax. As mentioned in a previous response, Behr makes a Venetian Plaster base coat that is fine as a gesso under encaustic, and probably cheaper than R&F’s in the long run, though Skulduggery mentions concerns about it’s very thick consistency. The thickness can be reduced by adding water. Sanding should always be done before/between coats – but I am talking about a really quick sanding – ten seconds or less is all you need to reduce the coarseness the gesso produces. Also to keep the coat thin, I use a small sponge roller (roller about 5 or 6″ long by about 1.5″ in diameter) to gesso my boards. I prep about 25 to 30 10″ x 10″ Baltic birch panels for the workshops I give in Toronto that way. With a fan on to speed the drying, by the time I am finished coating the batch, they are ready for the 10 second sand and another coat – piece o’ cake 🙂 ! For those of you unimpressed by the inconvenience of gessoing your encaustic substrates, I suggest you glue on white unsized paper instead of gessoing. Apply a thin, but even and consistent coat of an acrylic polymer – even inexpensive Podgy works – on one side of the paper or on the masonite or whatever board you wish to use, then carefully, but quickly attach the paper. Use a brayer to smooth away any air bubbles and allow to dry – takes about an hour, but you can speed up the drying process with a blow dryer. You can now use the paper-covered board the same way you would use a gessoed encaustic board. *Do not get any acrylic on the surface of the paper, just under the paper as glue. Next, I’d like to say to Kim varnishing encaustic artworks is generally not advised, though some folks do it anyway. You can use an oil based varnish to even out the finish of the oil/wax combo of media you have used on your works, but keep in mind almost all varnishes yellow at least a little bit over time. Variations in finishes on art works abound in the galleries of the world – everything from perfect uniformity to blatant and outrageous variations in finish can be found and are accepted. However, if the inconsistency in finish bothers you, the artist, go ahead and varnish with an oil based varnish – since, after all, oil and encaustic are ‘cousins’ to eachother and can be used in concert. Can you use encaustic gesso under oil stick? Do you know if Encaustic Gesso would work on a surface painted in oils. Would love to be able to gesso over an oil painting. Would be great to find a clear Encaustic Gesso. Another question: Can one paint an oil painting on a base of Encaustic wax? Is there any issue of incompatibility? If people are saying to not paint oil over acrylic, why are canvas’s sold primed with acrylic and why is gesso board so popular? While you may not be able to use encaustic over acrylic, I think it takes a lot of guts to say you can’t paint oil over acrylic. I planned an oil painting where I intended to apply a pencil drawing on top. The logistics of how to adhere something to a surface already painted in oil didn’t occur to me. Can I use encaustic wax to attach the paper? Do I need to sand back the oil in that area? Should I add a layer of wax on top of the drawing as well to embed it? Is this hopeless? 1. Can prepare my canvas with encaustic gesso and paint with acrylics over it? 2. What material would create the similar effect? Would be great to hear from you..
Is it ok to use linen glued right onto your rigid substrate ? Does it stay in the time ? I have quickly read through this thread and really appreciate all of the expertise I’m seeing in these comments and questions. I am an oil painter wanting to start using encaustic with my oil paint. While I understand that they are cousins and can be mixed together I am wondering if it is possible to use some of my old oil paintings as underpaintings and move immediately into wax base then painting over parts and leaving parts of the old showing. Will the wax base stick to the oil painting? I am new to encaustics and have been experimenting with some success; however, I’ve run into a problem on my latest panels while using R&F Encaustic Gesso. The first panel I used two thin coats but found that raised the grain of the wood too much consequently there are areas of texture in the painting. Fortunately the composition of the painting is not hampered by the texture and it is pleasing enough. My error was not sanding after using the gesso. The other panels I gessoed three times and sanded in between each coat using a very fine sandpaper for the final coat before adding wax to the surface. Well, I was disappointed when I put my first layer of wax onto the upper 1/3 of one of the panels…when the heat gun hit the area where there was no wax the gesso bubbled up. When I applied my next 1/3 of colour the same thing happened where the gesso was still exposed. After the final 1/3 of colour was fused I let the panel cool and was disappointed to find so many areas where the gesso had bubbled. I covered the whole panel with more wax and fused each layer as required; however, the bubbles did not disappear and texture is in undesirable places. What am I doing wrong?